Who and Where Is Hudson Faussett? The witty composition above is an image from Michael Powell’s last completed feature, Age of Consent. A pariah and an exile after his confrontational 1960 film Peeping Tom outraged the bluenoses of Great Britain, Powell had to leave his native country to find work. He directed a few American television shows for the producer Herbert Brodkin (who also threw a lifeline to Alexander Mackendrick, the expatriate director of Sweet Smell of Success), and then landed in Australia, where he made two features. The second of those, Age of Consent, is a lovely, optimistic work that I’ve just seen for the first time. It’s a sensitive, sensual study of sexual awakening, of an exotic, teeming semi-wilderness (an island off the Great Barrier Reef), and of the process of artistic creation. The opening sequence of Age of Consent takes place in New York City, where the protagonist, a painter (James Mason), gets fed up with the cynical art world and decides to seek a place to recharge his creative batteries. In an audio commentary for the DVD, film historian Kent Jones tells us that Sydney actually doubled for Manhattan in these scenes – a fact that’s obvious, upon reflection, from the bright red cab that James Mason steps out of, and from the presence of Frank Thring, an imposing Australian character actor who plays an art dealer. 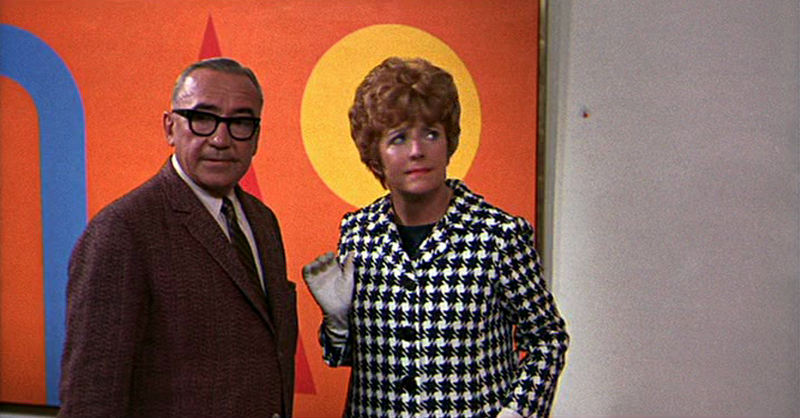 But during my first viewing I assumed that Powell had spent a few days shooting in the Big Apple, because he was able to cast two actual Americans as the pair of gauche nitwits who respond to Mason’s abstract art with utter clueless. Those Americans are the pair pictured above. The lady in front of the red circle is Peggy Cass, a Tony-winning stage and television actress who was, at the time, best known as a game show guest (primarily on To Tell the Truth). And the red triangle man? His name is Hudson Faussett, and he’s one of the lost figures of early television history. I’ve always wanted to know more about Faussett, and now, thanks to Powell’s film, I know what he looks like, at least. Age of Consent is the last place I expected Faussett to turn up, but it’s appropriate. It’s that kind of movie, a film of rebirths in unexpected places. In one interview, which I can’t locate at the moment, someone who worked with Faussett said that the joke was, if you turned him the right way, the Hudson River would come pouring out into Manhattan. (Get it? Hudson … Faussett.) That’s about as substantial a reference to Faussett that I can find (or not find, as it happens) on my reference shelf. The Internet Movie Database spells his name wrong, and a search of old press clippings proves that the variant spellings go all the way back to the beginning of his career, when he was a bit player in (among other things) the 1937 cult marijuana scare film Assassin of Youth. I believe “Faussett” is accurate, but in fact I’m not even sure of that. Later, in the late forties, Faussett resurfaced as a Broadway actor and director. By 1950, he was a staff producer and director for NBC, where he had a hand in the origins of several important shows. Faussett produced the early seasons of the half-hour Armstrong Circle Theatre, a dramatic anthology that changed formats several times during its long run. Faussett’s incarnation of Armstrong was not a venue for the kind of searing kitchen-sink dramas shown on The Philco Television Playhouse; rather, according to historian Frank Sturcken, it “offered sentimentality with ‘the pleasantly related moral.’” Which may have something to do with why we remember Fred Coe and not Hudson Faussett today. However, Sturcken (in Live Television: The Golden Age of 1946-1958 in New York; McFarland, 1990) also credits Faussett as the co-director of the historic two-hour telecast of “Macbeth” on The Hallmark Hall of Fame in 1954, for which Judith Anderson won an Emmy. Faussett was the “camera director,” handling the technical side of the broadcast, while the younger George Schaefer directed the actors. This kind of pairing occurred often in early live television – it echoed a brief practice of pairing experienced filmmakers with theater directors in the early talkie days of motion pictures – and usually what happened was that after a few shows the stage director, if he had any talent at all, learned camera technique and struck out on his own. That’s how my friend James Sheldon, who later worked for Faussett on Armstrong (directing, among other segments, “The Bells of Cockaigne,” featuring a young James Dean), began. So if Schaefer, who accrued twenty-one Emmy nominations (he won five) and continued his association with Hallmark for the rest of his life, learned a bit about directing from Faussett, that alone secures Faussett’s place in history. At NBC, Faussett also produced The Ford Star Revue, a variety show hosted by Jack Haley, and The Paul Winchell and Jerry Mahoney Show (Winchell was a ventriloquist, Mahoney his dummy). In 1958-1959, Faussett was the NBC producer for Tic Tac Dough; I’m guessing he was essentially an executive at this point, since Tic Tac Dough was packed by a pair of outside producers, Jack Barry and Dan Enright. Tic Tac Dough was one of the casualties of the quiz show scandals. It is the show for which Charles Van Doren auditioned before he was selected for his ultimately infamous stint on Twenty-One, a more popular Barry-Enright production. Eventually, evidence emerged that Tic Tac Dough was also rigged, by producers who fed questions and clues to the contestants. As far as I can tell, Faussett’s television credits end around this point. It’s tempting to speculate that his career, like those of Barry and Enright and Howard Felsher (the hands-on producer of Tic Tac Dough), was derailed by the quiz show controversy, but I don’t have enough information to know if that’s the case. What we do know is that by 1969, Faussett was living in Australia. Although Peggy Cass was imported from the States to play her bit part in Age of Consent, Faussett was evidently recruited locally. Faussett played small parts in other Australian films and television shows as late as 1990. Judging by his apparent age in Age of Consent, he must be deceased by now, but I can’t locate an obituary. Perhaps my Australian readers (yes, I do have at least one) could be of some help in that regard? CORRECTION: An earlier draft of this piece referred to Van Doren as a contestant on The $64,000 Question, rather than Twenty-One. UPDATE: Please be sure to read the comments sections for some helpful contributions regarding the mysterious Mr. Faussett. 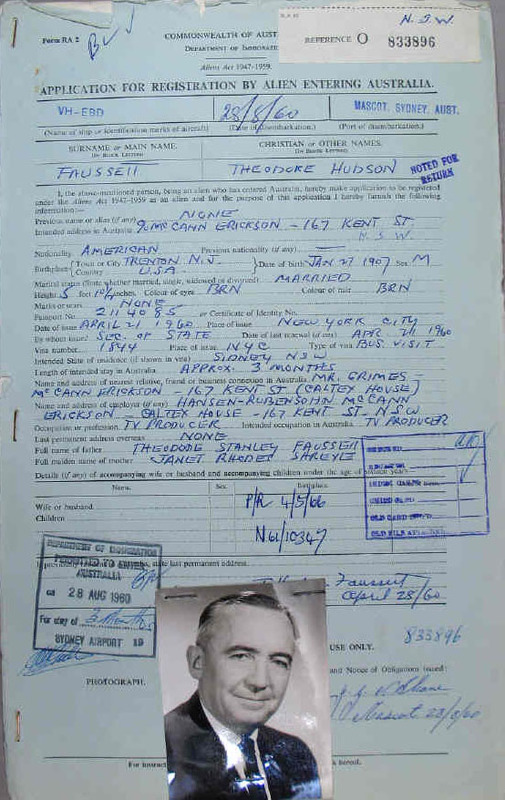 Australian reader (and media critic) Kit MacFarlane has unearthed a fascinating document from the National Archives of Australia (reproduced below) which confirms Faussett’s birthdate and the date of his initial move to Sydney, which was in 1960. It looks as if Faussett was an employee of the ad agency McCann-Erickson at the time, and had a job waiting in the Sydney branch of that firm. He listed his “intended profession” as “TV producer,” which then begs the question: did Faussett make any noteworthy contributions to the Australian television industry? Another point, which I thought too tangential to mention above, is that another American television producer emigrated to Australia sometime in the mid-to-late sixties: Charles Russell, the man famous for courageously giving blacklisted writers work on CBS shows like Danger and You Are There. (He’s the basis for a character in Walter Bernstein’s screenplay The Front.) Russell moved back to Los Angeles sometime before his death in 1986, but it’s possible that he worked in Australian television, too. I wonder if Russell and Faussett ever crossed paths Down Under and stopped to reminisce about the bad old days….